The Garden Court was designed and constructed by Robert Taylor as part of his last building works in the mid 1780s. 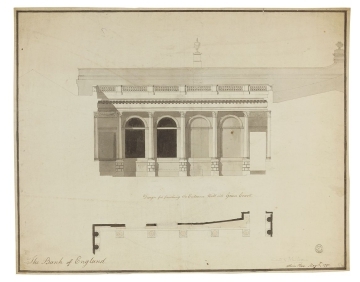 Taylor employed an Italianate arcade similar to his façades for the new wings but the east side of the Court remained the exterior of the Sampson's Pay Hall with a simple elevation and a single Venetian window. Soane sought to remedy the conflicting styles by designing an arcaded wall over the east side of the Court. 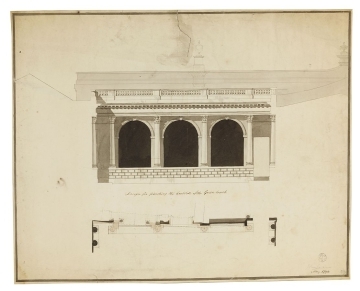 Drawings 4 and 5 show alternative designs for this arcade, employing a blind window just as Taylor had done on the north side of the Court (between the Court Room and Committee Room windows). The balustrades in both designs resemble the balustrade elevations attributed to Taylor (see SM 1/2/3-5, drawings 6 to 8 in 1:1). H. Rooksby Steele and F.R. Yerbury, The Old Bank of England, 1930, pp. 4, 10, 12.